Where Art Meets The City-Scape! Our Urban FX wholesale paintbrushes feature synthetic bristle material that works best over smooth surfaces such as metal, drywall, and tile. As your innovative paintbrush manufacturer, Dynasty Brush Company is proud to create superior synthetic features and brush designs that you will not find anywhere else. Our unique designs elevate the artist into reaching new heights of creativity. It is our mission to help artists achieve their goals by offering products that produce quality work. Natural Bristle which works best for painting mural, concrete, and brick. With its densely-packed ferrule, it allows for a continuous flow with a tremendous amount of paint creating a smooth flow over the rough surfaces and a good fill between the cracks because of the strength of its bristles. 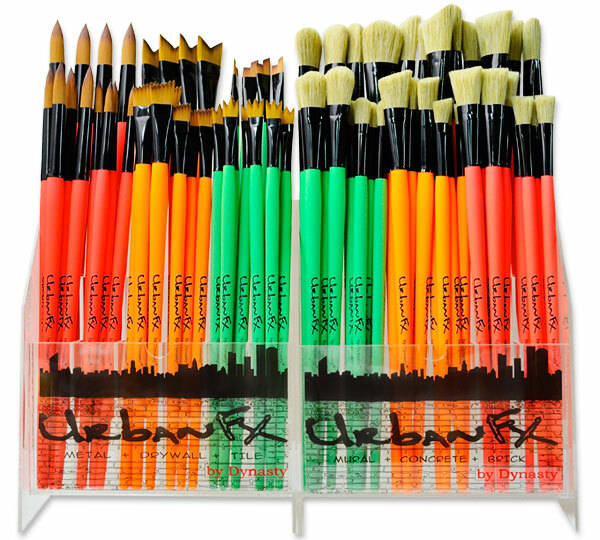 Whether you are seeking synthetic paintbrushes or a watercolor paint set, we offer many different collections that are sure to meet your artistic needs. When it comes to finding your niche and your favorite medium in art, Dynasty Brush is happy to be your artistic partner. If you are interested in learning more about other brush collections, contact us today at (66) 53 581044-5 or brush@fmtbrush.com. We are happy to answer any questions or concerns you may have regarding our products. Urban FX handles have a rubberized coating for a comfortable feel and non-slip grip for painting in all conditions.